A reader told us she’s tired of being tracked. 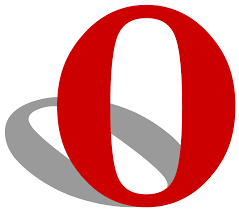 We suggest using the new Opera web browser. It’s free and you can get it from Opera.com. Once on board you will have a built-in “Virtual Private Network,” or VPN, as the techies call it. It automatically encrypts all your data so hackers can’t get to it, which makes it safe (at least until the counter-attack) when you’re using free Wi-Fi at the airport or a coffee shop. For your phone, there’s “Opera Free VPN,” from the iPhone or Android app stores. Besides safeguarding your data, it lets you into places you might otherwise not be able to go. For instance, some videos are restricted to certain countries. We’re looking at you, Germany. According to Ublockvideos, 85 percent of all these web restrictions apply to Germany. We have no idea why. To turn on the VPN in Opera on your computer, click the big red “O” in the left corner and choose “settings,” then “privacy and security.” You’ll notice a blue “VPN” badge in the corner of your screen. VPN toggles on and off. It goes off for sites like Google Maps, that needs your location to figure out your best route, but you can toggle it on again. Opera has a great reputation for speeding things up. However, using a VPN will slow it down a tad. We were never Opera fans until now, because we didn’t like the look of it. Our email always seemed a bit hard to read. Now everything looks great, a lot like Google Chrome, with one big addition. Off to the left are icons for Facebook Messenger, What’s App, Bookmarks, History, taking a screenshot and “Personal News.” Personal News has built-in sources, but you can add your own and remove theirs. A caveat: On some websites where you’re asked to fill out a form, only Microsoft Edge or Internet Explorer will do. Joy ran into this problem trying to submit a grant application for a local grad student, who ended up winning a $15,000 award from the women’s organization, P.E.O. She tried three browsers, but only Edge worked. Some of the videos we see on Facebook, like “The Evolution of Dancing,” are so good we want our non-Facebook friends to see them. But they can’t log in because they don’t have Facebook accounts. What’s a browser to do? We tried a screen capture tool that’s part of Corel Video Studio Pro, but that’s a $70 program with a lot of video editing power you don’t need for a simple capture. For $40, you can get Movavi, which we found easy to use. Define the area you want to capture by highlighting it with your cursor, or capture the whole screen. The sound comes in automatically and you can add a voice-over if you wish. There’s a seven-day free trial, but the videos you capture during the free trial will have the Movavi watermark in the middle of the screen. It didn’t bother Bob but it bothered Joy. Back to “The Evolution of Dancing.” Turns out if we had just Googled it, we would have found it on YouTube, rather than doing a screen capture. In the future, if you see something you like, it doesn’t take long to see if it’s also on YouTube. “Cow Rescued After Hurricane.” Search on that term to see a one-minute video of a calf raised as a pet after it nearly drowned. The family dog, who was also rescued from the flood, helped nurture it back to life. Warning: this could be heart-warming; Joy had tears in her eyes. “Common Coffee Mistakes.” Search on that term to find an article from BusinessInsider.com. Mistake one is not buying it fresh, like bread. Another is keeping it longer than a month. 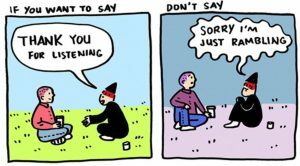 “Cartoonist Shows Why You Should Say Thank You Instead of Sorry.” Much better results! Paragon Software is giving away free software for looking at Mac files on a Windows machine. Go to paragon-software.com/home/apfs-windows to download it. Then connect a drive that has Mac files on it. Then, in Windows Explorer you’ll be able to see the Mac files that are normally undecipherable. First tap “Photos” on your iPad. Second, look along the bottom of your screen and tap one of the categories you see, such as “albums.” Third, tap on a photo you want to share on Facebook. Fourth, look at the top of the photo. To the left of the trashcan is a square with an up arrow. Tap on that up-arrow to copy the photo to Facebook or some other part of the universe. A reader was worried because the power button on her computer wasn’t working and she was afraid if she turned off the computer, she’d never get it on again. Why not leave it on until the new part arrives from Dell? Bob seldom shuts down his computer unless the system forces a restart for an update. Before the environmental crowd starts pounding on our door, we got some specifics on the electricity cost from MichaelBluejay.com. He pointed out that an iMac left on in sleep mode would have an electricity cost of $6 a year if actively used for only two hours. A Windows computer would be similar. Bob has always maintained this was the case, but never in polite company.